"Hello BlueParrott" | Avcomm Solutions, Inc. The words "Hello BlueParrott" are the beginning of a beautiful friendship ... with a new Bluetooth headset from BlueParrott. 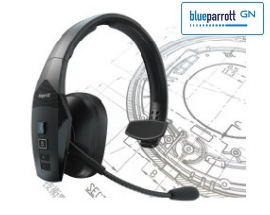 This 5th generation BlueParrott headset, the new BlueParrott B550-XT, is the world's first truly hands-free headset. Use your voice to activate the headset and control calls, use GPS, music, voice assistants and more. This much anticipated headset will be valuable to people who drive for a living - and need to maintain contact with people at home, the office, and use navigation tools to arrive to the right place. Voice Controls such as "Am I connected?" "Redial" "Check battery" "Pair mode" "Call back" and others provide that hands-free convenience with commonly-used functions most Bluetooth headset users need. And, the battery life in this headset is phenomenal: up to 24 hours of talk time! 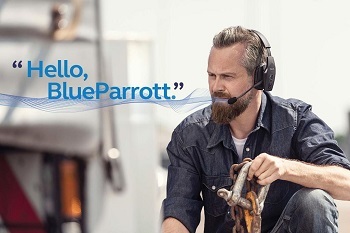 We like the noise-canceling microphones in BlueParrott headsets; BlueParrott reports that the mics have "96% noise canceling" and what we know for sure is that our customers like the clarity their conversations have. A flexible mic boom allows for precise mic positioning near the mouth. 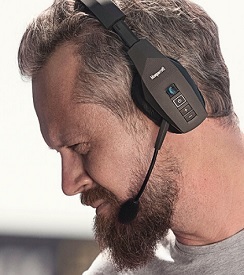 These headsets are found in every major truck stop in the United States, and more often than not, when we see truck drivers, they are wearing BlueParrott headsets. With some of the noisiest office environments in the world (tractor-trailers), this is the seal of approval and assurance that BlueParrott is a top quality brand with loyal customers. The BlueParrott button on the ear speaker is customizable with the BlueParrott app; there are also volume up and down buttons and in between those buttons, there is a Power and Answer/End button. The app is available as a free download in the Apple App Store and on Google play. The headset is packaged with a USB charging cable, foam ear cushion, microphone windscreen and a Quick Start Guide. Call us at 1-866-998-9991 to speak with one of our headset experts today and purchase your B550-XT!